DNT Cabin Booking is a system for booking lodging at theDNT self-service and no-service cabins listed here. This page is devoted to the why, how, and what of booking. See the Frequently Asked Questions at the bottom of the page. There's been a demand for advance booking to ensure accommodations for families, particularly those with young children. We wish to offer guests the option of advance assurance of a bunk at a cabin. On the whole there are available bunks at our cabins, but the most popular cabins can be crowded, particularly in high season. We hope that advance booking of accommodations will encourage more people to hike and ski. There's a space guarantee: about 60% of a cabin's bunks may be advance booked, while the remaining sleeping accommodations are available for guests who arrive without having booked. Search for a cabin on UT.no. 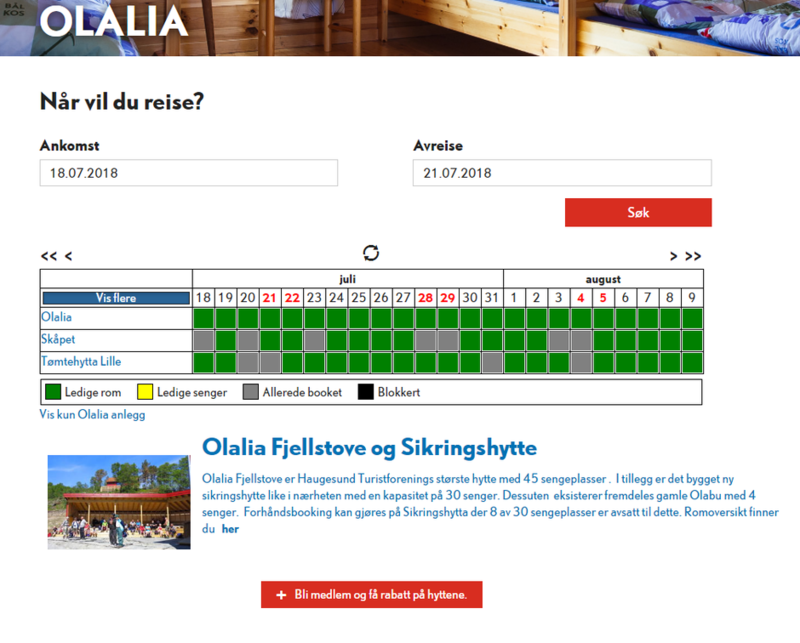 On the cabin page there's a button for booking an overnight stay [Bestill overnatting]. You need not be a member to advance book a bunk, but it costs less if you're a member. As always, only DNT members may borrow (against a deposit) a cabin key that fits the locks of many unstaffed cabins. If you're not a member, your party should include a DNT member who has borrowed a key. A DNT membership number must be given when booking at the member price. Rooms and bunks are numbered for lodging that may be advance booked. So when booking, try to fill a room as much as possible. Note whether a cabin is locked with a DNT Cabin Key or a special key. A booking is valid until 7 p.m. After 7 p.m. other guests may take advance booked bunks, so you may have to find another bunk, as in another room, or space in a loft. An advance booking is valid payment even if you must find another sleeping accommodation at a cabin. Enter your name and other information, such as an advance booking payment, in the cabin register book. Pay for provisions taken from the larder with a direct debit single authorisation. Prices are divided into age groups and whether you are or are not a DNT member. Overnighting is free for members up to age 12. Might I risk finding no accommodation at a cabin? Also note that many cabins near cities require advance booking, such as DNT Oslo og Omegn's cabins in Nordmarka. Green - "Room available" [Ledig rom] - all bunks available in selected room, indicates ample space. 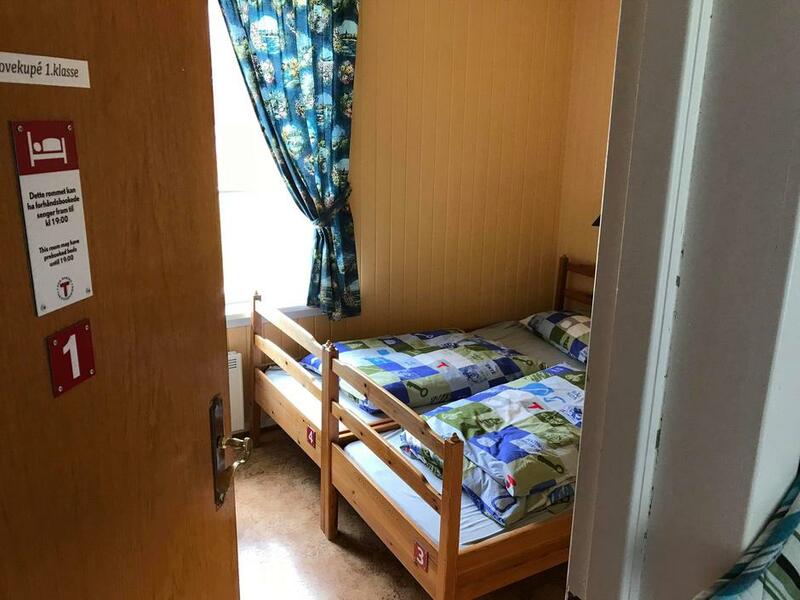 Yellow - "Bunks available" [Ledige senger] - some bunks already booked in a room; not certain that you'll have the room alone. Grey - "Already booked" [Allerede booket] - all bunks available for booking are already booked, but the cabin still has bunks not available for advance booking. Black - "Blocked" [Blokkert] - cabin not available for guests, due to being fully booked by a group tour, being closed for maintenance, or otherwise being unavailable. Does advance booking cost more? No, the price is the same. How can I book accommodations for a dog? Rooms allocated for dogs and their owners are designated in the room names. There are various ways of paying for dog accommodations. Some cabins offer kennel booking, while others permit payment for a dog by direct debit single authorisation. After you've sent in a booking, you will receive an E-Mail booking confirmation. The booking confirmation has a cancellation link. A cancellation will be refunded to the payment card used in booking, and according to DNT cancellation rules. Conditions for using DNT self-service and no-service cabins in lowlands and mountains. Note whether a cabin is locked with a special key or the DNT Cabin Key. If a cabin is locked with a special key, pick it up before you depart. (See further information on a cabin at UT.no). Rules for use, "How To Get There" directions, and other relevant information on a cabin are on its page at UT.no. Cancel a booking via the cancellation link in the booking confirmation sent by E-Mail. Cancellation prior to 10 days before the arrival date gives a 100% refund. Cancellation prior to 5 days before the arrival date gives a 50% refund. (*) If one wishes to overnight at a cabin other than the one originally booked, the settlement period is 10 days (5 days before - 5 days after the booked arrival date). Settlement applies to "free" bunks, that is bunks that cannot be advance booked, and bookable bunks after 7 p.m. (latest arrival). This applies only to self-service and no-service cabins. For other matters, contact a DNT member association. Contact details are in the booking confirmation and at UT.no.